The early life of the Norwegian painter Edvard Munch was tragic. Tuberculosis ravaged his family. His mother died of the disease when he was young, as did an older sister. Another sister suffered from mental illness. Though Edvard’s father worked as a medical officer, he was not paid much and the family was poor. 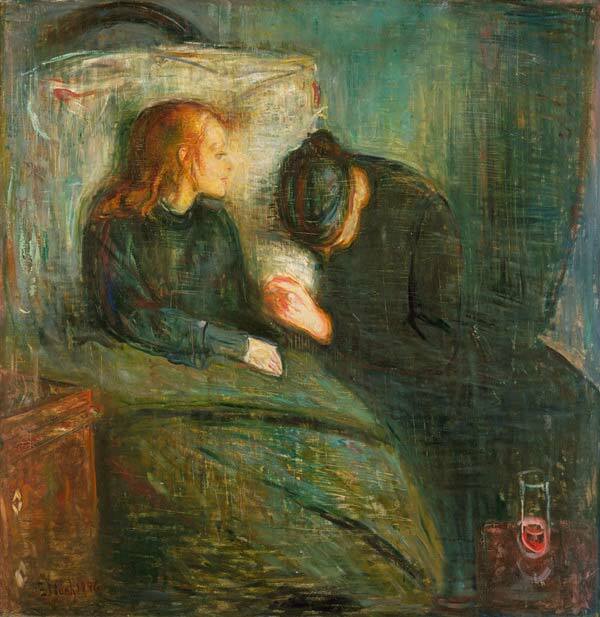 Munch himself was a sickly child, and much of his artwork flows from the atmosphere of sickness, dread and terrible grief that lay over the family. 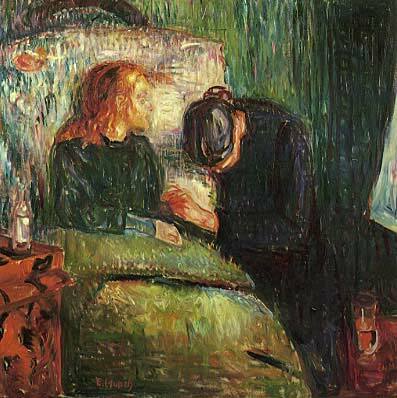 It is not surprising, given Munch’s background, that there are at least six versions of The Sick Child. They all explicitly refer to the trauma of his sister Sophie’s death from consumption. Her death so disturbed her brother that he painted and repainted the scene over the space of 40 years. The first painting was finished in 1885 and the last was finished around 1927. In The Sick Child, a girl is propped up against a large pillow, which is propped up against the headboard of what seems like a small bed. The pillow mostly hides a mirror on the wall. The child has obviously been suffering. She is thin and pale, and her red hair is lank. She is propped up to help her breathe. 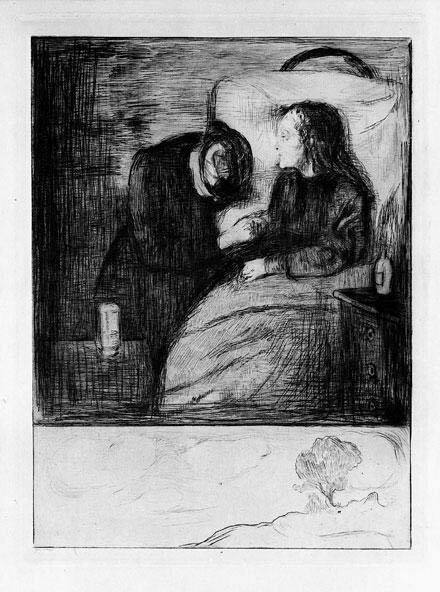 Munch also created at least one headshot of the girl and it seems that her hair is not only thin, but the hair around her brow has fallen out because of her illness. In the larger paintings, she is also dressed in funereal black. Beside her kneels a woman, also in black. Her black hair is in a bun and her head is bowed in either intense prayer, grief, or both. One of her hands holds the sick child’s hand. Critics mostly agree that the sick child is Sophie, and the grieving woman is her aunt Karen. The child does not look at the woman beside her but stares at the curtain on the right side of the frame. She is stricken with the kind of exhaustion that comes from long and unrelieved pain. For some critics, the curtain, which presumably covers a window, represents the escape of her upcoming death. Munch arranges items in the room to give the viewer a sense of near claustrophobia. Everything is crowded and too close. We may wonder how a grown person like the aunt can move around the room. To the left is a chest of drawers on which sits a bottle of medicine. On the opposite, lower corner, is a table that holds a glass. The space between them is taken up by the greenish folds of the blanket that covers the lower half of Sophie’s body. The painting, in its various incarnations, is an example of expressionism, which privileges the artist’s subjective experience. Often, the figures in expressionist works are distorted to emphasize the emotions that went into the work or to convey a mood. 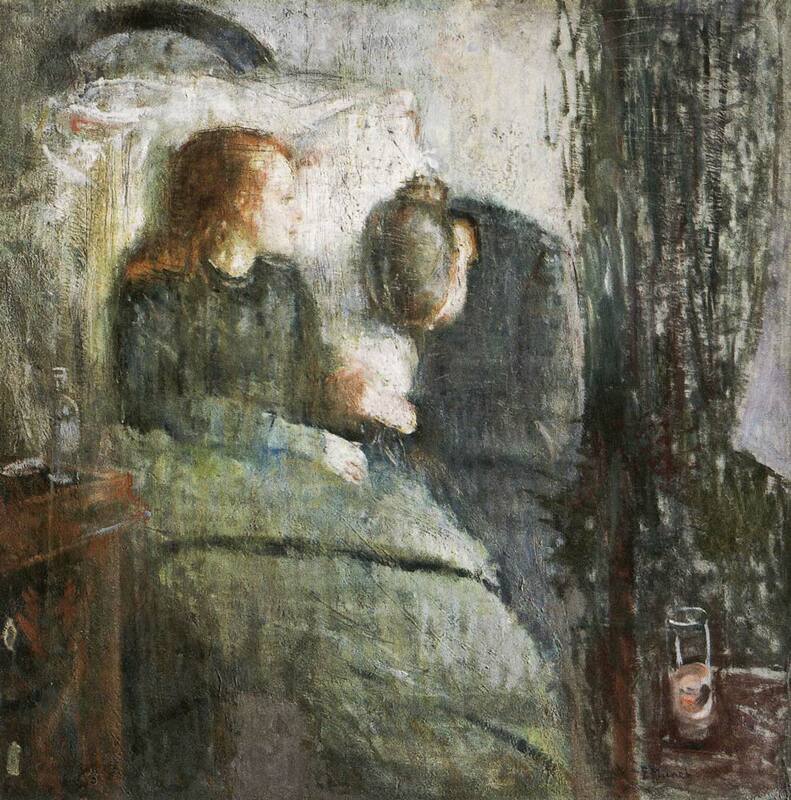 So in the original Sick Child, Munch’s brushstrokes are harsh and the color palette consists mostly of dreary blacks, whites, greens and grays. The young painter had worked on the canvas for months before he was satisfied with it. The viewer can see where he scraped areas of the canvas and over-painted others. This technique adds to the painting’s overall mood of sorrow and despair.